No, Michael Kors didn't make that orange bedazzled "Copa" jacket that Barry Manilow wore to perform at the designer's show. We're not sure who did, but it was fabulous. NEW YORK (AP) — Michael Kors threw a fashion show worthy of Studio 54 with Barry Manilow belting "Copacabana" on a glittery stage and rock muse Patti Hansen walking the runway Wednesday. His crowd, seated inside a Wall Street ballroom, went wild for both on the closing day of New York Fashion Week as he rolled out shaggy coats and feather boas, sparkly gowns in neon purple and electric blue, and flirty ruffles on dresses and skirts, all worthy of the heady '70s. NEW YORK (AP) — Marc Jacobs didn't waste a second before starting his runway show on Wednesday. Literally. The designer, whose high-profile show traditionally closes out Fashion Week, was clearly determined to make amends for a September show that began 90 minutes late, leaving fashion editors tapping their heels and checking flight schedules. This time he started his show the very second the clock struck the appointed hour of 6 p.m.
NEW YORK (AP) — Hip-hop icon Lil' Kim slayed as a blonde at The Blonds, performing her new song "Go Awff" to close the design duo's New York Fashion week show inspired by "Scarface" and other classic gangster movies. 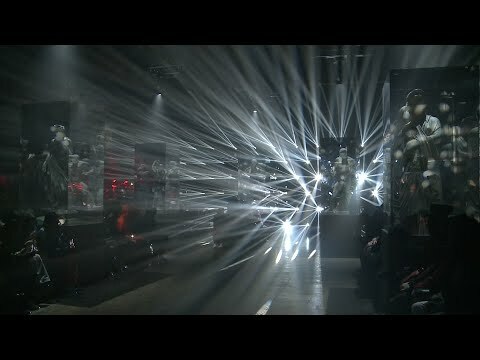 NEW YORK (AP) — Christian Cowan was finding it hard to stand still backstage after his high-energy show on Tuesday, practically jumping up and down in place. The British designer, at 23 already a favorite of celebs like Lady Gaga and rapper Cardi B, presented a new collection that harked back to his days as a London club kid but also channeled New York-style energy. NEW YORK (AP) — The designing duo at Oscar de la Renta, Laura Kim and Fernando Garcia, presented a collection of relaxed silhouettes and colorful, eclectic clothes on Tuesday, a runway show they said was inspired by a multicultural Spain. "We wanted to do a Spanish collection for Oscar but today's Spain, the real Spain," Garcia said. NEW YORK (AP) — Naeem Khan brought 1970s glam back to New York Fashion Week with the help of a few models of the era. The Halston icons Pat Cleveland, Karen Bjornson and Alva Chinn closed Khan's show Tuesday in silver sequined evening gowns, joined by the veteran designer on the runway for his bow. Khan is known for his sparkling evening looks, but he got his start at Halston back in the day. NEW YORK (AP) — Bella Hadid and Kaia Gerber looked positively pop-tastic on the New York Fashion Week runway of Anna Sui's 1960s-inspired show where short, teased wigs in groovy hues of blue, purple and pink took center stage. NEW YORK (AP) — When the last model walked down the Carolina Herrera runway in a floor-length, billowing gown that looked like a huge white shirt, it was a playful nod in two ways. First, it was a take on the tradition of ending a fashion show with a bridal gown. And second, it was a nod by designer Wes Gordon to his predecessor and her famous love for a crisp white shirt. NEW YORK (AP) — Zadig & Voltaire's artistic director, Cecilia Bonstrom, is Swedish, but she had Parisian fashion culture on her mind Monday at New York Fashion Week. NEW YORK (AP) — In seasons past, you could count on Proenza Schouler's designers, Jack McCollough and Lazaro Hernandez, to come up with the most innovative and cutting-edge technologies to create new fabrics for their creations. Now, the designing duo, in their second Fashion Week back in New York following a stint in Paris, says they're going back to basics by eschewing groundbreaking technology to focus on traditional fabrics this season. Technology, says Hernandez, can sometimes be "a crutch." NEW YORK (AP) — Perhaps in another life, Nicky Zimmermann would have been a spy, an extremely chic one. The Australian designer had espionage on her mind for fall Monday at the New York Fashion Week show of her Zimmerman label. NEW YORK (AP) — In a story Feb. 8 about a Badgley Mischka New York Fashion Week show, The Associated Press reported erroneously that it was the label's spring show. It was the company's fall show. Veteran evening wear designers Mark Badgley and James Mischka painted the town red at their fall show during New York Fashion Week. NEW YORK (AP) — Tory Burch was inspired by higher learning for her fall collection at New York Fashion Week. Specifically, she looked to Black Mountain College, a progressive school in North Carolina. "I'm amazed by how many people don't know about it," Burch said backstage. "It was founded in 1933, rural North Carolina and it's really where modern art started in America. Not started but really informed the trajectory of modern art." NEW YORK (AP) — If there were a best-view award at New York Fashion Week, Christian Siriano would win it. The sights outside the designer's runway show atop Rockefeller Center were hard to beat: The Empire State building, the Chrysler Building and other Manhattan landmarks, just as the sun began to set on a cold but clear Saturday. NEW YORK (AP) — With a strobe light show worthy of a seizure warning and classic statuary in clear boxes, Milan streetwear cool guy Francesco Ragazzi brought his celeb-popular Palm Angels brand to New York Fashion Week on Friday for the first time. NEW YORK (AP) — CHAOS! HORROR! PANIC! BABY, IT'S HOT! Designer Jeremy Scott has always liked to make news, but with his latest collection he did it literally, drawing design inspiration from New York's tabloid headlines. Chromatically speaking, Scott's runway show Friday evening at New York Fashion Week was a very disciplined collection in all black and white; Scott usually uses a riot of bright colors and large cartoon graphics in his clothes. NEW YORK (AP) — Designer Elie Tahari celebrated his 45th anniversary show with a pair of models at either end of their careers — veteran Christie Brinkley, 65, and her rising star daughter, Sailor, 20. The blonde mother-daughter duo on Thursday seemed to capture Tahari's theme of ageless beauty and timeless fashions. "I am so honored to be here, and I think that it is so wonderful that he chose me and my daughter to present both ends of the spectrum," Brinkley said. NEW YORK (AP) — "Can I get you some Ralph's Roast?" Immaculately dressed young waiters offered coffee and pastries as soon as you sat down at Ralph Lauren's scaled-down fashion show on Thursday, a stark contrast with last season's lavish anniversary extravaganza in Central Park. There was no stage, no spotlights, just models sauntering casually among the tables at Ralph's Cafe, Lauren's recently opened cafe space at his Madison Avenue women's store. NEW YORK (AP) — Tadashi Shoji mixed plus-size models with the usual ultra-thin ones Thursday at New York Fashion Week, rolling out evening gowns with high slits, capes and sari influences in deep reds and blues, along with classic black. Some of his touches were an ode to a favorite vacation spot, Southeast Asia, along with the monks of his religion, Buddhism, the designer said in a backstage interview. "All the culture, history, architecture, costume. Those kind of stuff inspire me," Shoji said. NEW YORK (AP) — A brilliant green gown in sculptured silk satin by Charles James, the late American master couturier, gleams like a just-polished emerald as you enter the archives of the Museum at the Fashion Institute of Technology — a huge, climate-controlled space that houses more than 50,000 garments and accessories. PARIS (AP) — Louis Vuitton's designer Virgil Abloh transported celebrity guests at Paris Fashion Week to the graffitied streets of New York in a dramatic menswear ode to Michael Jackson. Abloh, the first African-American to head a major European fashion house, used his unique platform Thursday to celebrate one of America's most globally recognized and celebrated black performers. Here are some highlights of Thursday's fall-winter shows. 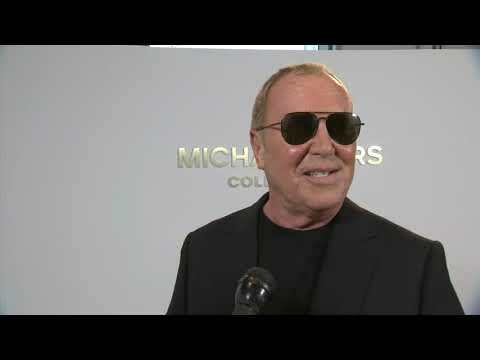 NEW YORK (AP) — Michael Kors' response to these turbulent times is to provide a dose of effervescence to lift the mood — and that was certainly the case with his New York Fashion Week show. The event, which drew celebrities including Nicole Kidman, Catherine Zeta-Jones, Tiffany Haddish, Iman and Hailee Steinfeld in the front row, featured a collection that had romance, color and a dose of the flirty. NEW YORK (AP) — In recent years, Marc Jacobs has become known for starting his runway show — which traditionally closes out Fashion Week — with military precision at 6 p.m., no matter who's running late. It was a shock, then, when Jacobs kept his guests waiting for 90 long minutes on Wednesday, tapping their feet and staring at their phones. NEW YORK (AP) — In a story Sept. 11 about a fashion show put on by Studio 189, The Associated Press reported erroneously that Studio 189's clothing line was called Fashion Rising. While it was once called that, it now goes by the name of Studio 189. NEW YORK (AP) — Since arriving in New York two years ago to revitalize Calvin Klein with his hip European sensibility, it's often seemed that designer Raf Simons has taken an oversized bite of the city's fashion world. It's perhaps apt, then, that his latest collection should be a riff on the movie "Jaws." She was inspired, in part, by the 1955 Vincente Minnelli film "Kismet." "One of my favorite scenes in the movie is when she went shopping and she was walking through this beautiful marketplace and that is my favorite thing on earth to do," Sui told The Associated Press of Monday's show. "In every city I travel to, I want to find out where's the flea market." NEW YORK (AP) — In the first show since creative director Wes Gordon took the reins on Carolina Herrera's line, he brought bright colors, patterns, bold prints and voluminous evening gowns to the runway at New York Fashion Week. "In a gray, scary, uncertain world, Herrera should be that rainbow in your wardrobe," Gordon said after the show, staged amid paintings on the walls of the New York Historical Society. NEW YORK (AP) — With healthy doses of bright pinks and yellows, in butterfly prints and a palm motif, Naeem Khan's spring-summer collection felt sunny side up at New York Fashion Week. There was, of course, plenty of the bling Khan is known for in gowns that have landed on the backs of queens and first ladies. Those allowed to wear open backs, one-shoulder in jersey and raffia fringe are more than welcome. NEW YORK (AP) — Prabal Gurung had a lot to say at New York Fashion Week, and he said it in living color. The designer sent models from 35 countries around the globe down his runway Sunday, chosen to represent a world where "all humanity reigns." Because, as Bruce Springsteen said in Gurung's closing song, we can "Dream Baby Dream." NEW YORK (AP) — After two seasons in Paris, Proenza Schouler designers Lazaro Hernandez and Jack McCollough are back at New York Fashion Week— and emphatically so. With their new collection unveiled Monday, they've gone all-American in spirit: denim, denim and more denim, with almost no embellishment — no embroidery, feathers or sequins. And though the fabric came from Japan, the collection was entirely made in the United States. After two seasons in Paris, Proenza Schouler designers Lazaro Hernandez and Jack McCollough are back at New York Fashion Week— and emphatically so. With their new collection they've gone all-American in spirit: denim, denim and more denim, with almost no embellishment — no embroidery, feathers or sequins. The collection was entirely made in the United States. NEW YORK (AP) — To woots and cheers from the crowd, women with bodies not often seen on fashion runways strutted with smiles on their faces wearing pieces from Loft's new plus line, including five cast from hundreds who attended an alternative New York Fashion Week event, The Curvy Con. NEW YORK (AP) — Sophie Delafontaine had tastemakers Anita Pallenberg and Veruschka on her mind when she was figuring out how to celebrate the 70th year of her family's business, Longchamp. NEW YORK (AP) — Bejeweled bodices, thigh-high platform pumps, stiletto nails and seductive fishnet stockings brought a new level of femme fatale among Disney villains onto the catwalk. The catwalk of the design duo The Blonds, that is. David and Phillipe Blond, known for edgy, provocative collections and runway shows, collaborated with Disney to merge the wicked and the sleek among its most famous villains — Ursula, Maleficent and more. NEW YORK (AP) — A rosy hue washed over a room at the New York Public Library as models wearing vibrant pinks, greens and blues followed a winding silver line of glitter on a pink carpet. The shimmering line was an homage to late designer Kate Spade at the New York Fashion Week show of her former brand.